Enjoy color in your gardens all year long by adding plants that are attractive in fall and winter! You can easily mix these plants in your gardens to achieve year round interest. Place the plants strategically in spots where you can view them through your window during colder months. 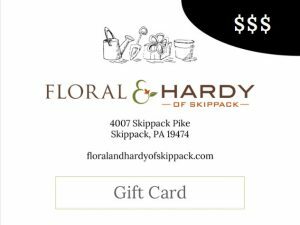 This will allow you to enjoy your gardens even during stark winter days. 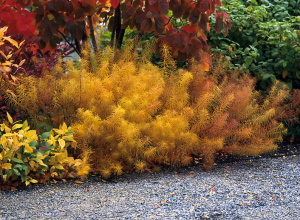 There are many plants that can add color and texture to your landscape during fall and winter. Some produce colorful berries, leaves or bark while others develop cool looking seed heads. 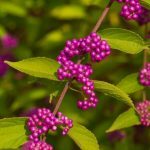 Listed below are examples of perennials, shrubs, grasses and evergreens that can add appeal to your gardens during multiple seasons. Hellebores. 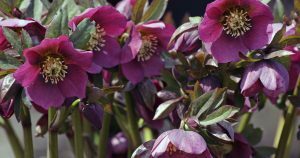 Commonly known as the Lenten Rose, hellebores are some of the earliest perennials to bloom from late winter into spring and have long lasting flowers. They’re trouble-free plants with evergreen foliage, making them attractive all four seasons. Amsonia. 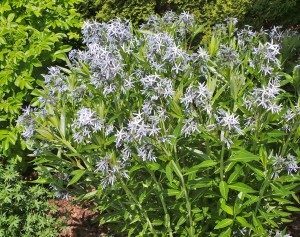 This plant is known for its beautiful true blue star-shaped blooms which form on dense clumps of thick upright stems. The stems are covered by narrow, lance-shaped green leaves that turn bright golden yellow in the fall and last a long time. Baptisia. 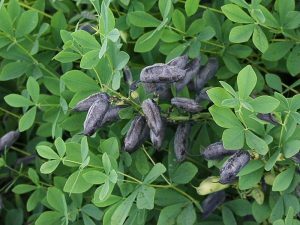 Commonly known as false indigo, baptisias have something to offer every season. They have thick, asparagus-like stalks in the spring with beautiful dark blue/purplish flowers. They develop blue-green leaves and seedpods that add interest to the remaining seasons. Echinacea (Purple Coneflowers). Purple coneflowers are a favorite summer blooming plant that produce large, daisy-like blooms with a spiky center. They have seed heads which stand out in winter gardens and attract goldfinches and other birds. Rudbeckia. Black-eyed Susan flowers (Rudbeckia hirta) produce multiple dark seed heads after flowering and are also favored by seed-eating songbirds. They’re hardy plants and a common beautiful sight in meadows during summer and early fall. Solidago (Goldenrod). Goldenrods have feathery, branching clusters of bright yellow flowers that stand out in fall gardens and are beautiful in floral arrangements. Some varieties are spreaders but other hybrid types are more compact and non-invasive. Sedum. The genus Sedum contains hundreds of species from small ground covers to upright varieties like the popular ‘Autumn Joy’ and ‘Autumn Fire’. They bloom mainly in the fall with clusters of flowers that remain attractive in the winter. Asters. There are a variety of asters that bloom mainly from late summer to late fall. Asters are a popular perennial with bloom colors ranging from white, pink and red to purple. They’re drought tolerant and add a splash of color to fall gardens. Chrysanthemum. These plants are a main-stay of fall gardens and are available in a variety of vibrant colors. They’re dense, sturdy plants that love full sun and well-drained soil. Beautyberry (Calicarpa americana). 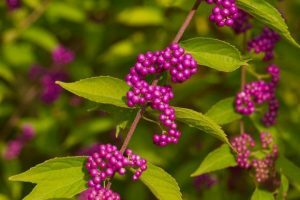 This plant is known for its beautiful cluster of small purple berries along drooping branches. It has yellow-green fall foliage and the berries provide food for all different types of birds during fall and winter months. 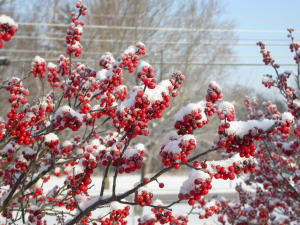 Winterberry (Ilex verticillata) brightens up winter landscapes with its vibrant red berries. This is a native shrub that loses its leaves each autumn but has thousands of brightly colored berries clinging to each stem. Winterberry stems look stunning in winter container arrangements and holiday floral arrangements. 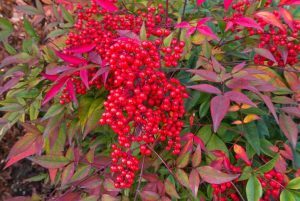 Heavenely bamboo (Nandina domestica) is a semi-evergreen shrub that displays lacy, scarlet foliage in the fall. It also produces sprays of graceful red berries in fall and winter, attracting wildlife. Viburnums are hardy shrubs that have great fall color leaves, ranging from yellow to red or purple. Viburnums have profuse white to pink flowers in spring and lovely midsummer berries which turn a darker color in fall. There are many different types and some have beautiful spreading branches that stand out in a winter landscape. Fothergillas are native, low maintenance shrubs that don’t require pruning. They have abundant showy white blooms in spring and summer with a sweet fragrance. Fothergillas also have fiery fall foliage with vibrant colors of purple, red, yellow and orange. Virginia sweetspire (Itea virginica) has four seasons of interest, featuring fragrant, tiny white flowers that cover the shrub in late spring/early summer. Its oval, dark green leaves turn pretty shades of red and gold in fall. The leaves often stay on the plants until early winter. Ninebark (Physocarpus) The traditional foliage color of ninebark is a stunning deep purple. This plant produces pretty pink and white flowers in the summer. Ninebark is more well known for its interesting bark in the winter. As the bark of the older stems age, they peel back in layers, creating a cool exfoliation effect. Caryopteris/Blue Mist Shrub produces clouds of blue flowers in late August through fall and has aromatic foliage. The shrubs are drought tolerant and deer resistant while attracting many butterflies and bees. Oakleaf hydrangea (Hydrangea quercifolia) is a hardy, native type with oak-shaped leaves that turn a lovely red/deep purple color in fall. During winter, the blooms remain dried on the stalks and can be used in flower arrangements. 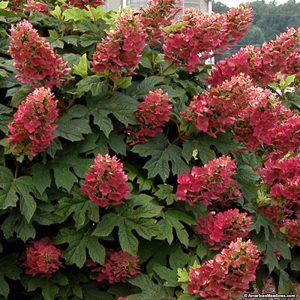 ‘Lava Lamp’ Candelabra™ (Hydrangea paniculata) is another type of hydrangea that’s attractive during fall and winter.It has brilliant red/pink flowers in fall and stems that turn bright red during winter. 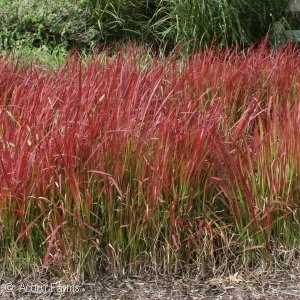 ‘Red October’ Big Bluestem (Andropogaen gerardii) has attractive foliage all four seasons – gray-blue in spring which deepens to blue-green in summer and turns a brilliant scarlet color in fall/winter. It’s also drought and deer resistant! ‘Standing Ovation’ (Schizachyrium scoparium). This grass has spikey bluish-green stems and leaves that transition to a striking display of oranges, reds, and purplish-browns in fall. ‘Little Miss’ (Miscanthus sinensis) is a dwarf grass that has slender green foliage which takes on reddish, purple tones in summer and fiery shades in fall. It’s an ideal accent plant for small gardens and containers. Japanese Blood Grass ‘Red Baron’ (Imperata cylindrica) has stunning foliage that starts green at the base and changes to burgundy red further up the blade. It provides a brilliant seasonal display in both fall and winter seasons. Evergreens include cone-bearing trees and shrubs (conifers) that come in all sizes, shapes and colors. Conifers have foliage that is needle-like in pine trees and flat or scale-like in an arborvitae. 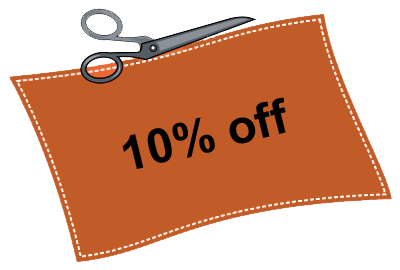 They provide great all season interest and the dwarf and miniature versions are becoming very popular. In addition, broadleaf evergreens such as boxwood, hollies and rhododendrons keep their leaves and provide color throughout the winter. 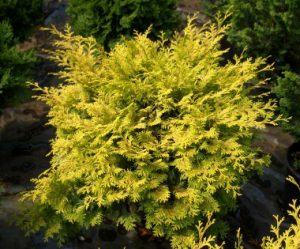 Cypress: ‘Gold Thread Cypress’ (Chamaecyparis pisifera) – hardy brilliant evergreen conifer that forms delicate lacy mounds with yellow, threadlike new growth. Boxwood: ‘Little Missy Boxwood’ (Buxus microphylla) is a compact boxwood that’s great for borders, standing out with small glossy dark green leaves. 1.‘Sky Pencil’(Ilex crenata) is a Japanese Holly that has a sleek, stylish look with a tall, narrow columnar shape. It grows no more than 2 feet wide and you can prune it to a smaller width. Height ranges from 5 to 10 feet. 2. ‘Blue Prince/Princess’ (Ilex meserveae). Blue Prince and Blue Princess combine to produce famously festive holly berries. In early spring, little white flowers appear and it keeps beautiful blue-green foliage throughout fall. 3. ‘Helleri’ (Ilex crenata) is a slow growing cultivar that has tiny, glossy evergreen leaves. The plant only reaches 2 to 4 feet tall. 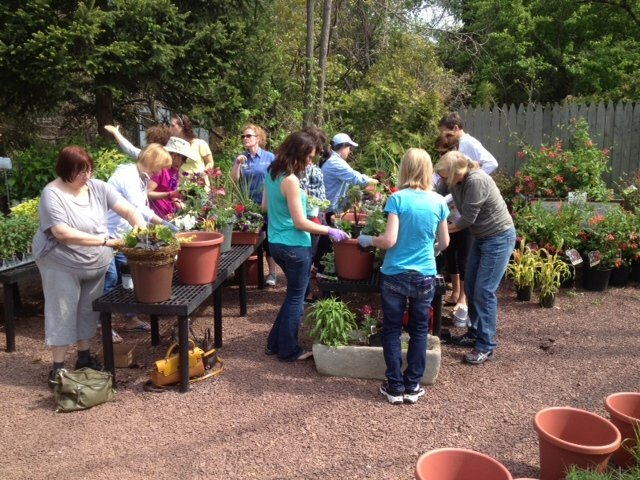 For more information about plants that add fall and winter interest, contact Floral & Hardy at 610-584-0797.